As a follower of Christ it’s great having friends who you not only enjoy being around, but will tell you hard things. True friendship is when that works in both directions. There are many friendships where it only works one way. You know it’s a good friendship when you can part company after a tough discussion with a big hug and a “love ya man” no matter the conversation. I’m sure you know the kind of friend I’m talking about. It’s one where you can spend hours with that person or in a group of people (which is especially fun) and laugh until you can’t breath. You look forward to your time together. If there’s significant time in between meetings, you can continue on as if it were yesterday. But the “specialness” of the relationship I’m talking about isn’t just the fun, but those “real” moments that turn serious. Moments when you talk about spiritual things. Eternal things. Family. Personal struggles. sadness, anger and more. Lee Geysbeek, Chris Geysbeek, Jeremy Fleming, Greg Yoder at Griffins Hockey game (2018). This friendship is more than words or time together, though. It’s demonstrated. Calling or texting out of the blue asking each other to do something — watch a baseball or hockey game, grill halibut, steaks, or eat our favorite wings and ice cream. Meet for breakfast or coffee. A guy who texts your daughter to tease her and show love for her. When you have that kind of friendship — a trusting deep relationship kind of friendship — you not only value it you crave it. But when your friend’s heart beats for the last time you grieve. You grieve hard. You cry ugly tears (stealing words from my friend Amanda) because you know that kind of friendship can’t ever be replaced. You even get angry wishing you’d said more, hugged more, got together more, laughed more, prayed more, read more and dreamed more because that person isn’t here anymore. You KNOW you’re going to grieve because THAT’S missing. Then you feel guilty because you’re friend’s family seems to have it more together than you do. As a follower of Christ you feel guilty because you’re constantly wishing them back. It’s selfish. It’s NOT what they would want. In past conversations the “shut-up, I’ll be with Jesus” conversation comes to mind and you realize that just about everything we talked about had that common ending — Christ. Being with Christ. Having a relationship with Christ. My friend Lee Geysbeek lost his life to a heart attack on Saturday, December 1, 2018. As I type that, I have to quickly correct it. While he lost his physical life, he gained eternal life with Christ alone. Lee has so many friends. It would be insulting to him or them to say any differently because I believe each one was special to Lee. The only reason I say that is because of the hundreds of people who came to his celebration of life service who said, “Lee was such a good friend.” We often said to each other, “You’re my brother from another mother.” But for ME, Lee was one of MY closest friends. He was the guy I called when I needed advice professionally, personally, and spiritually. I can safely say that because I don’t have too many people I say that about. How’d it start? In 1988, Lee wanted to hire me at a radio station in Grand Rapids. While I turned him down that time, in 1995 he asked me to become the Executive Director of Mission Network News. I don’t know why. I didn’t have the right credentials. I wasn’t even sure I had a passion for it. But I accepted and that literally changed my life. I went on and served at MNN for 20 years. Professionally, our leadership team at Cornerstone University had a great bond. Our love for Christ was the passion. Together we won awards, went on trips, and more. I felt grateful and indebted to him. But over the last 30 years our relationship changed from that cool guy in GR who offered me a job, to boss/employee relationship (which only lasted a few months), to becoming a true friend. I’m nothing like Lee. I can name my top friends on one or two hands. At Lee’s celebration of life service there were hundreds of people who loved him. One person I met said he was one of Lee’s closest friends. I can’t recall Lee ever mentioning him, but that doesn’t mean it wasn’t true. Lee love people. I’m sure Many people had similar relationships that he and I had. How can I honor my friend? How can I honor God? What do I do when I need “Lee” advice? I don’t have answers to any of these questions. But this is what I do know. I want to be more like Lee, which is really being more like Christ. I want to show love to more people. I want to remember names better. I want to spend a lot of time laughing. I want to encourage people. I want my family to say that I was a loving father. I want my wife to feel adored. I want people to know that I LOVE Christ and that’s what I’m about. I want those who disagree with me to enjoy our time together even though we disagree. One of the things Lee and I shard, the same verse that convicts us and motivates us. I Timothy 1:15b-16, “Christ Jesus came into the world to save sinners—of whom I am the worst. But for that very reason I was shown mercy so that in me, the worst of sinners, Christ Jesus might display his immense patience as an example for those who would believe in him and receive eternal life.” We talked openly about sin we struggle with. After lamenting, we were quick to remind each other that God’s grace is greater. While the grieving continues, and the sadness lingers, I’m thankful for Lee Geysbeek. It was a friendship that started 30 years ago. It was a friendship that “was ordained from God.” That was Lee’s response to everything and I’m sure he said that about ALL his friendships. It’s hard to understand, but even Lee’s passing was ordained. You lived well, Lee. You taught us how to love. You taught us how to laugh. You taught us it was okay to cry. You taught us God grace is truly amazing. You taught us that the Gospel is the most important thing. For me, you taught me that even guys give big bear hugs. Madison, Wisc. (K4K) – Sometimes it’s amazing to see God work. What seems like a coincidence becomes God’s perfect plan when you see the whole story. That’s the case with Sonja and Kathryn, who have an uncommon friendship that could only have been orchestrated by God’s hand. Sonja is from Madison, Wisconsin. About three years ago this 74-year-old woman was waiting to be taken home from the hospital when another woman introduced her to the Keys for Kids devotional and asked if she could use a copy. Sonja says she jumped at the offer, as she was discipling a little neighbor girl, Kathryn, who was from a Buddhist family. Sonja told us that when she began working with Kathryn, the young girl didn’t know what a manger was and referred to the cross as a “God thing.” Now that’s all changed. Kathryn writes, “When I was six years old, I asked Jesus to be my Savior and come into my heart. This summer at five-day club I dedicated my whole life to the Lord. One of the ways to grow and please the Lord is to read His Word and pray. I read Keys for Kids every day and look up the Bible verses. Thank you for this wonderful devotional. Your support allows us to not only meet the needs of our current programs but also launch new ones. Our new mobile app, the Keys for Camps follow-up program, and a new Keys for Kids Radio website (keysforkids.net) were all initiatives that are igniting a passion for Christ in kids and their families. If you’d like to support our work, go to keysforkids.org/donate to help. Grand Rapids, Mich (K4K) — I have traveled all over the world. Many say our world is falling apart. Wars, social injustice, and child abuse have left their marks. What’s the common theme? Children are suffering. They’re the ones who suffer most in these situations. Through no fault of their own, they’re left to try to survive as adults make mistake after mistake. While the physical suffering is heartbreaking, even more heartbreaking is that many are suffering without knowing Jesus. And as they grow up, many are looking for truth. In Arab nations, many believe the lies of Islam. In India, it’s Hinduism and Buddhism. In North America it’s humanism and materialism. In Syria, children are homeless. They’ve been forced from their homes because of years of civil war. Death is all around them. In India, the fight against the caste system continues, and abject poverty enslaves them. In America, they’re enslaved to something aspired to throughout the world — greed. The physical suffering is obvious, which draws the attention of millions of dollars. But the spiritual suffering isn’t as clear. And it’s not just affecting those struggling physically, it’s hit our kids, too. Our culture has told our kids our world wasn’t created, it evolved by chance. God has been rejected and at times our faith has been called hate speech, and gender is now considered a matter of choice. There has to be answers to all of these issues. There is one answer, Christ alone. There is a window of opportunity that we have to speak to children. Barna Research tells us that nearly 70% of all people who gave their hearts to Christ, did so between their 4th and their 14th birthdays. That’s called the 4/14 Window. That means we have a brief 10 year window in which to reach them with the Gospel, and help them grow in their faith. Interestingly enough, ministry leaders at the 4/14 Window indicate 80% of all kids worldwide are searching for spiritual truth. That’s right. They’re searching for it. That’s why support is needed today more than ever to to make sure ALL kids can not only have God’s Word, but understand it. That’s why Keys for Kids Ministries is needed today. It’s providing stories that are pointing kids to God’s Word, where they’re learning the only hope for paying for their sins is Christ. As they’re reading God’s Word, the coinciding stories are helping them understand Scripture and how it applies to them TODAY. The lessons they learn are providing them the tools they need to defend their faith — becoming apologists in a world craving answers. Keys for Kids is at a crossroads. There are over a billion kids who need Christ, but we’re only printing a few hundred-thousand each year. The only way to change this scale of need is to ask God for a miracle. That miracle, though, starts with you. Keys for Kids devotionals are igniting a passion for Christ in kids and their families (Photo by Greg Yoder). Your financial support may be the tool God uses to motivate someone else to reach out in a profound way. Your prayers may be what releases an amazing blessing from our Father. Or, your passion for this ministry via Facebook or Twitter could be the viral fire we need to exponentially grow this ministry through grassroots marketing efforts. The biggest problem we have isn’t that there is a need for God’s word to reach kids. It’s knowing that Keys for Kids Ministries has the tools to empower parents, grandparents, friends and nieghbors to share Jesus with kids all around them. Would you become a Keys for Kids ambassador? Begin by sharing this story. Follow it up by encouraging people to “like” our Facebook page (Facebook.com/keysforkidsministries). Then, start sharing our daily email devotionals. Purchase copies of our printed devotional to leave in the lobby of your church, local business or other community centers. Go to keysforkids.org to find out more about Keys for Kids Ministries. You can also listen to our full-time radio station for kids at keysforkids.net. In reading many posts of Christians internationally, many seem shocked that evangelicals voted for President Elect Donald Trump. I estimate that nearly 20 million American evangelicals voted for Trump. There were many reasons. Some voted out of fear of Hillary Clinton and her policies that we felt would destroy the American foundations as we know them today. We were concerned that she would appoint Supreme Court Judges who would arbitrarily change our constitution, rather than by the proper ratification by the people (i.e. The states). We were concerned that her pay-for-play international get rich scheme would continue. We were concerned that she would continue to appease radical Islam, making our country more unsafe as the Obama administration did with Iran. We were also angry that the media failed to talk about her roll in her husband’s multiple affairs — destroying the lives of women who were his victims. We were also concerned about her two agendas she has (one public and one private) which she clearly outlined in a speech to big supporters. I voted for Trump because I wanted to STOP Hillary Clinton’s 30 years of scandals which seem to follow her wherever she goes. I voted for Trump based on the good men and women he chose as his running mate and advisors. I chose Trump because he named his Supreme Court nominees before he was elected and all are constitutionalists, not activists. I voted for Trump because I didn’t feel that the current administration was concerned enough about leading the world and less concerned about our national security. Because I voted for him, the other side has called me terrible names. Because I voted for him, the other side is protesting our American way of life (our election system) which is a revolt and protest against our constitution. Some are even saying they want a Revolution. Because I voted for him people now question my salvation (some international Christians have,too). So, why am I writing this? If nearly 20 million evangelicals prayerfully voted for Trump and God allowed him to win, don’t you think you owe it to God and your fellow Christians to wait and see what President Elect Trump does BEFORE you judge us? I would never pick Trump as a friend. I agonized over who I should vote for. I certainly wouldn’t have picked him as my candidate to win the primary, (my choice was Ted Cruz) but God did. Why? I have no idea, but I’m anxious to see what could happen. Since everything has a purpose, I’m curious to see God’s plan. If you are a Christian, PRAY. America needs Jesus more than ever. Those protesting, many of them are paid agitators. Many are lost young people with no moral compass. Many are decent people who are scared because of a corrupt media who told lies about Trump and left out the truth about Clinton. There have been a few journalist who have apologized for their behavior. Many of them need the hope of Christ. One thing is certain, this IS God’s plan — for better or for worse. Greg Yoder in the Keys for Kids studio recording Parent Minute. Grand Rapids, Mich (KFK) — In just a few days I will be celebrating eight months in my current roll as executive director at Keys for Kids Ministries. While that’s not a lot of time when you consider I had spent 20 years at my previous ministry, it’s very little time when you consider all that God is doing at Keys for Kids Ministries. Each month I write a thank-you note to each donor. This month, I was encouraged by the KFK team to write something more personal — to share my heart. I was told, “Write something that will excite our friends, because we’re excited.” Then I started thinking, wow, God has allowed us to do a lot of things in these short eight months. And we have some amazing opportunities ahead of us if funding, people, and God allow it. So, here are the highlights of the previous eight months. In January, Uncle Charlie retired from from being on the air on Keys for Kids Radio. We said hello to Zach, who has hosted Down Gilead Lane for years. Who is Zach? He’s a guy all the church kids love. He’s that 20-something young man everyone looks up to. He helps out with youth ministry, he’s the camp counselor at summer camp, and he’s involved in just about every activity where volunteers are needed at church. That same month, Keys for Kids Ministries launched two new radio programs and relaunched another one. One is called Keys for Kids 60. It’s a radio feature that’s similar to our Keys for Kids 4 1/2-minute broadcast, but much shorter. Radio stations were asking for it. We also retooled the 4 1/2 with new music. Zach hosts both broadcasts. Because of his concern about biblical illiteracy in the church, Zach is passionate about the need for children to know God’s Word. We also launched Parent Minute. I’m the host for that. It’s a different kind of broadcast. I’m an average parent and grandparent who’s succeeded and failed. The goal is to talk about those successes and failures to other parents and grandparents with the prayer that we can learn something from each other. Since it’s focused on Scripture, God is leading our time together. Keys for Kids Radio (keysforkids.net) also made some programming changes to help make our friends in Europe, Africa, and Australia happy. Our radio coordinator Dylan Kraayenbrink has created 24 hours of quality programming for kids to enjoy. No longer will children in Australia be hearing lullabies in the afternoon when it’s midnight in the US. They’ll get to hear all of their favorite music and programs, too. Already we’re seeing more kids listening in these areas of the world. We just received a story from a mother in New Zealand whose two children gave their hearts to Christ within eight weeks of listening. This month we’re officially launching our Keys for Camps program. While the launch is a pilot program this summer, the desire is to help thousands of young people develop a devotional life every day. We’re doing that by partnering with Christian camps. When a young person goes to one of these partnering camps, they’ll receive a Keys for Kids devotional. The camp will teach them how to use it each day at camp, then when they go home they’ll finish the devotional. Each quarter thereafter they’ll receive their Keys for Kids devotional at home with a custom cover from their summer camp and a message from their friends encouraging them to stay in God’s Word. We’re starting with just four camps this summer, but we’re hoping that dozens and dozens will join us next summer. 1. Share Christ with kids. 3. Provide a revenue stream as they become the distribution hub of children’s ministry material in their country. Keys for Kids, meanwhile, will print the devotionals here in the US, allowing short-term mission teams to use them as they travel into these nations, or as they reach out to immigrants in North America. The audio produced by these translators will be used on audio Bible devices. Organizations are telling us there is a huge demand for children’s Bible stories in audio. We’re hoping to launch Keys for Kids on the audio devices in Mandarin Chinese, Spanish, Greek, and Macedonian before the end of the year. This month, Keys for Kids will be sending out our first newsletter. It’s called KeyNews. I’m not a fan of the name, but that’s what it’s called for now. At least twice a year you’ll be receiving information about the amazing things God is doing through Keys for Kids Ministries. You’ll hear reports on young people coming to Christ. You’ll read why donors are excited about this ministry. We’ll feature stories about new programs and special opportunities that need prayer and financial support. However, these newsletters are NOT about raising money. They’re about keeping you informed. So, a lot has happened. We’re also in the middle of what we’re calling the Keys for Kids Growth Initiative. We’re trying to raise a little more than $200,000 to update all of our Keys for Kids technology, which will prepare us for future growth in the mobile app world as well as technology we don’t even know about yet. We’re very close to meeting that goal. If you’d like to invest in the Growth Initiative, please get in touch with me. I’d love to talk to you about it. Are we raising moral kids, or godly ones? Teach your kids the Truth. Grand Rapids, Mich. (KFK) — All Christians want to raise moral children. There certainly isn’t anything wrong with that. We all want our children to know the difference between right and wrong and good and bad. But, are we placing too high a priority on morality and not enough attention on Grace alone, through faith alone, though Christ alone? Now that I’m involved in children’s ministry, I’ve noticed a lot of children’s devotionals, Sunday school material, and other youth curriculum is light on Grace, Faith and Christ alone theology and heavy on works theology. In other words, much of today’s youth discipleship material teaches kids that they need to do something in order to be saved. They need to say a prayer, stop sinning, be good, and love people in order to be saved. At Keys for Kids, we’re providing stories that help kids 6-12 understand Scripture. Those devotionals translate into our radio features heard on radio stations around the world. Our goal is to fight the works theology mindset and focus on the Gospel of Christ. We want young people to know that salvation is an amazing gift. We want them to be thankful for their salvation. So much so that they begin asking, “Why am I a Christian, but my sister isn’t?” Or, “Why is it that a Muslim terrorist in Syria has a dream about Jesus and turns to Him, while a radical Hindu in India doesn’t? We want young people to be so thankful that God has saved them that they can’t help but share the Good News with their family, friends and even strangers they meet. Frankly, I hope that excitement spills over to their brothers and sisters, moms and dads and grandmas and grandpas. In 2015, 180,000 Keys for Kids Devotional books were sent to children, families and churches around the world. Hundreds of thousands (maybe millions) more pages were read on our website, daily email and our Keys for Kids app. If you have a child in your life, sign up to get your complementary copy of our quarterly Keys for Kids devotional. While it is free, we’re asking people like you to help fund this ministry with your gift of $25, $100 or even $1,000 to help us produce even more devotionals. Click here to get your devotional. If you don’t have children this age in your life, but you want to help Keys for Kids grow, we’re quietly launching the Keys for Kids Growth Initiative. It’s a $206,700 initiative that will help Keys for Kids develop and upgrade our technological infrastructure which will power our new robust mobile app, website, online games, 24/7 radio network, while positioning two areas of ministry to be self-sustaining. We already have commitments of $100,000, your gift of $10,000, $25,000 or $50,000 will help propel Keys for Kids Ministries into a bright future — a future where the truth of Scripture is needed more today than ever. If you’d like to get involved in this larger goal, click here. For those of you who know me, you know how much I love Russia. I have traveled to Russia about a dozen times. My fascination with this country started when I was a kid, during the “cold war.” I was always concerned about the possibility of another World War. More importantly, I was always concerned about a nuclear attack. I thought often about the number of Russian kids my age who were also concerned about it. If they were concerned, we weren’t that different. So, with that backdrop I tried to learn everything I could about the Soviet Union. I wanted to know why they thought the way they did. Why would a government oppress their people so badly? Why would people accept that kind of oppression. Why wouldn’t the Soviets want freedom. Why wouldn’t they do something about it? As the interest grew, I always thought that I would like to visit Russia some day. Fast-forward to 2003 my wife and I were talking about adoption. After much research we decided to adopt a child from Russia. Because of that I kind of feel like we’re connected to Russia in some way. We also developed a love for orphaned children in Russia. As a result we have travel multiple time to Russia with a couple of different groups to provide love, compassion, and the Gospel to kids who have either have been abandoned or orphaned. Up until now Christians from the west have been able to do it fairly freely. Most of you know that I work with Mission Network News. This week I did an interview that would break my heart. On April 30, 2015 the United States Commission on International Religious Freedom issue their religious freedom report. For the first time in the history of the report (1998) RUSSIA was included in the report. According to the 232-page document, there are 17 nations listed at Tier 1 abusers of religious freedom. They include: Burma, Central African Republic, China, Egypt, Eritrea, Iran, Iraq, Nigeria, North Korea, Pakistan, Saudi Arabia, Sudan, Syria, Tajikistan, Turkmenistan, Uzbekistan, and Vietnam. What does this mean? This means that the severity of Russia’s persecution against Christians has reached a point where even government are paying attention. President Vladimir Putin has created legislation that has a direct impact on evangelical churches and para-church ministries. If they receive any funding from outside of Russia, the government considers them foreign agents. They’re basically calling them spies. If you’ve studied Russian history at all you know that just about the time things were going well, they self-destruct. Look it up for yourself. Why am I blogging about this? Because I want people to pray. 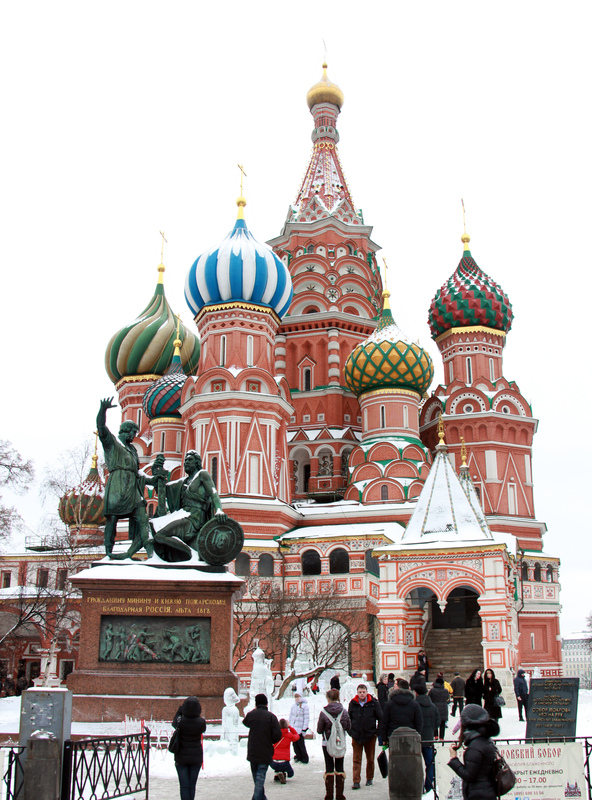 There are many evangelical Christians who are actively involved in Russian government. Pray that God will allow them to use their influence to make a difference. Also, pray God would do a work in President Putin’s heart. He’s obviously being more aggressive on the international stage. He’s sending nuclear capable aircraft into American and European airspace, he’s bend on invading Ukraine and other form Soviet Bloc nations, and he’s making friends with Iran, North Korea and China. But, God is also doing an incredible work in the hearts of people in both Ukraine and Russia. If you’d like to know more about what’s going on there, go to MissionNews.org. It’s hard to believe it’s been almost a year since I posted anything on this blog. I guess I’ve been involved in other things that are more important. I guess the Mission Network News website redesign has taken most of my free time. My family has taken the rest. And, so has my recovery. Let me explain. Last year, about this time, I was trying to get my knee into good enough shape so I could go to the Winter Olympics in Sochi, Russia. I made it. 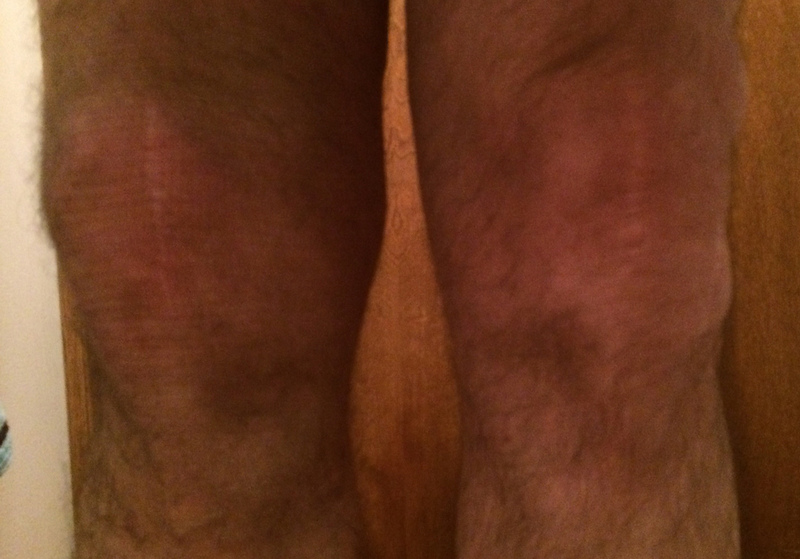 Unfortunately, though, me knee was pretty damaged. I completely tore a ligament in my knee, the medial patellofemoral ligament. That’s the thing that keeps your knee cap from sliding to the outside part of your leg. Despite the fact that it was torn, I eventually started running on it again. In fact, I was getting close to running as fast as I was before my injury. Unfortunately, though, I had to wear a brace to keep the knee cap in place. So, On September 16 I had another surgery. This one was the medial patellofemoral ligament reconstruction where the doctor takes a piece of your hamstring tendon, the screws it into your femur and knee cap. This surgery was a little different, in terms of recovery. 1. The doctor didn’t limit my weigh bearing on my leg. As soon as I could feel it, I could put weight on it as long as I had my knee brace on. 2. I could bent it up to 90 degrees right away. 3. Therapy started pretty quickly. I started therapy two weeks after surgery and continue working on it. I am making progress. Today, nearly three months after surgery I am riding a bike and on the elliptical riding at least 30 minutes on Monday, Wednesday and Fridays. I’m also lifting weights and other exercises. I’m hoping by January to be running again. Okay, why is this about Christmas in the air? It’s because it is. It’s December 11 and I can’t wait until we can get together as family and just hang out together. In the mean time, I love the smells of homemade hard candy, the snow and the music. This year, our church – Grace Community Church in Hudsonville, Michigan is having a great concert feature the Annie Moses Band. Our church choir will be singing with them. On one hand I’m excited about being a part of the concert, but disappointed that I won’t be able to hear them as well. If you live in West Michigan, I hope you’ll join us. Tickets are only $15 at itickets.com. 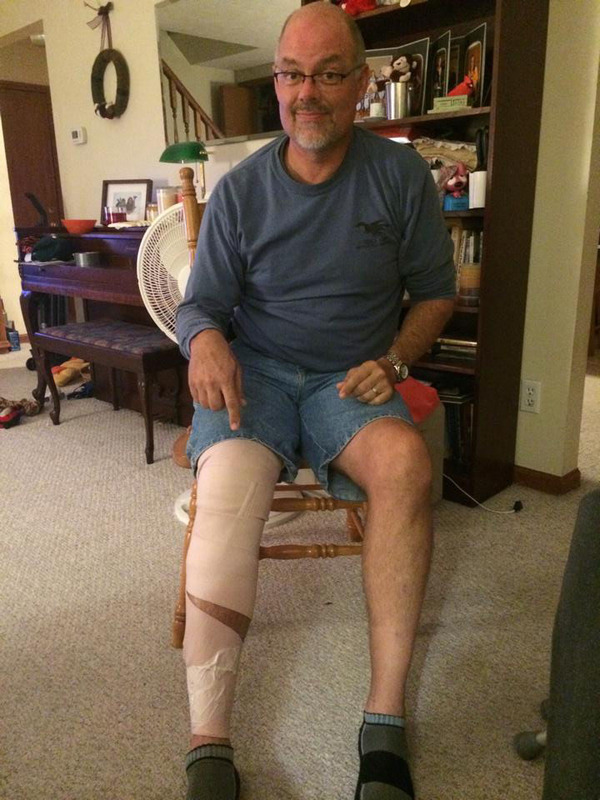 On Saturday, December 21 it will be four weeks since I dislocated my knee while trying to be safe while running in Johnson Park in Kent County, Michigan. It’s funny how I have played the scene over and over again in my mind. I keep asking myself, “how could I have avoided this injury.” The more I think about it, the more I realize this wasn’t an “accident.” This was planned. It wasn’t MY plan, but God’s plan. I’ll explain that in a minute. What does that mean for my recovery, or the possibility for surgery? It means I’m going to continue with therapy until I have to leave for the Olympics, hoping the strength in my quadriceps improve to where I won’t need surgery. The knee cap isn’t as stable as I would like right now, but it’s making progress. If I was allowed to, I could jog and run up stairs. But, I am only allowed to spend as long as I like on a stationary bike. I enjoy that. I’m finally working up a sweat. Why do I think God planned this for me? As I look back on the past four weeks I’ve been forced to slow down. Instead of focusing on make my mileage goal for the week or month, I’ve been focusing on my family. I’ve spent more time keeping the holiday traditions alive. I actually made Christmas candy this year. I’ve spend more time in God’s Word than I have in a long time. I’ve been forced to trust the Lord more. What are my plans? I plan to work hard and run again. While I may not be able to start running again until February, I may be forced to run the 10K at the Fifth-Third Riverbank Run, rather than the 25k. But, we’ll see. Life is a constant curve-ball, isn’t it? It has been nearly a week since my misfortune, or God’s sovereign plan (whichever you choose call it in this instance), hit me. I dislocated my knee as I was running in Johnson Park. I took two days to try and get the swelling under control. With it being Thanksgiving Week, I had to get to work to help write ahead so we could take Thursday and Friday off for Thanksgiving. Today, was a discouraging day. I woke up with pain in my knee that I haven’t had until now. I’m beginning to wonder if indeed I’m going to need surgery. This isn’t something I want or have time for. It doesn’t look like I’m coming to terms with God’s sovereignty, am I? I’m trying to wrap my arms around it, but I’m feeling more like Solomon than Paul. In other words, I’m believing more and more that all is vanity. I woke up to my knee looking like this. While it doesn’t look too bad, maybe even a little bit better, I now can only bend it about 80 degrees. That means it difficult doing anything — dressing, taking a shower, getting out of cars, sleeping (I sleep on my side in a ball — at least i did)anything that requires me to bend my knee. 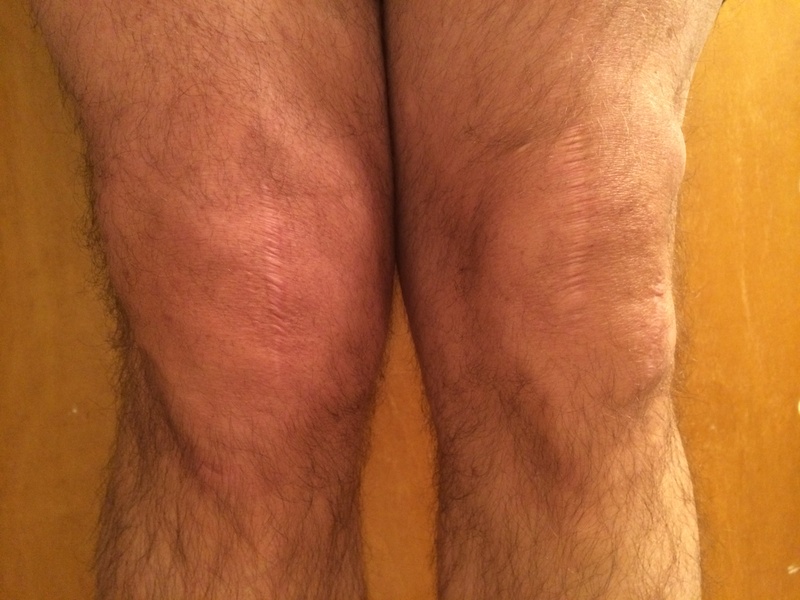 In 2010 when I injured the same knee in about the same way it required a very painful surgery. They don’t do arthroscopic surgery. They have to open up the whole knee to repair the patellofemoral ligament. It is so painful that they planned on keeping me overnight. The second and third day after surgery is horrible. Then, no weight bearing for almost a month. Therapy is intense. The first step is getting the knee to bend again, while at the same time doing a little strength training. It took a long time. I had the surgery in March and didn’t start exercising on it until June or July. 1. I only have 45 miles to hit my goal of 700. I have all but come to the conclusion that I won’t be hitting that goal. 2. I’m supposed to travel to Russia to cover the Olympics in February. If I have to have surgery, I won’t be going. That’s so disappointing. 3. I have worked so hard to lose 30 pounds running and cross-training. To think I’m going to have to start over from square one is deflating. 4. I was hoping to run in the 5th 3rd River Bank Run (25k) again in May 2014 and if I need surgery, that won’t be possible. 5. If I have surgery, I won’t be able to drive. I know, all of this seems selfish and childish. I’m sure there are many others who have much more difficult issues facing them. Issues that are life threatening, debilitating, and scary. For me, I’m just wallowing in self pity, even though I’m scared trying to figure out what’s ahead for me. The stupid thing is, I haven’t even seen the surgeon yet. He may say I don’t need surgery, in which case I’ll be working my tail off trying to get my knee back into shape so I can run again. All of this takes me back to Scripture. I Peter 5:7 “Casting all your cares upon Him for He cares for you.” Is just one verse that’s a little convicting. Or Matthew 6:25-34 “Therefore I tell you, do not be anxious about your life, what you will eat or what you will drink, nor about your body, what you will put on. Is not life more than food, and the body more than clothing? Look at the birds of the air: they neither sow nor reap nor gather into barns, and yet your heavenly Father feeds them. Are you not of more value than they? And which of you by being anxious can add a single hour to his span of life? And why are you anxious about clothing? Consider the lilies of the field, how they grow: they neither toil nor spin, yet I tell you, even Solomon in all his glory was not arrayed like one of these.” Or how about, “It is of the LORD’s mercies that we are not consumed, because his compassions fail not. They are new every morning: great is thy faithfulness. The LORD is my portion, saith my soul; therefore will I hope in him. Lamentations 3:22-24. I know all these things in my head, but understanding them with my heart is tough right now. So, what do I do? I just keep plugging along re-reading and re-reading Scripture that I know is true and reminding myself that I DO believe it, which I do. I’m just being a little hard headed.